On January 10, a meeting in the case against Ukrainian activist Volodymir Balukh was held in the Kremlin-controlled Razdolnensky district court of the occupied Crimea, according to the website of the Crimean Human Rights Group. During the "court session", the so-called judge Elena Tedeeva granted Balukh’s defence motion about interrogation of six defense witnesses. “Elena Tedeeva granted the petition of the defense of Ukrainian activist Volodymir Balukh on interrogation of six defense witnesses whose testimony would refute a number of documents and evidence in the criminal case,” the report said. "Judge" gave two days to ensure the attendance of all the witnesses. Furthermore, Tedeeva filed a procedural complaint against Balukh’s lawyer, because of the absence at one of the meetings. The next meeting of the "court" was scheduled for 9:00 on January 12. QHA reported that Tedeeva granted the illegal petition of the prosecutor in the Balukh case. The prosecutor filed a petition to attach evidence to the case materials, which are not in the indictment, which is illegal. During one of the previous hearings, an ambulance for Volodymyr Balukh was called to the building of Razdolnensky district “court” controlled by the Kremlin. Balukh filed an application for the termination of the "judicial" meeting, as he felt ill and he could not continue participating in the meeting. However, doctors in Crimea ignored the deterioration of Balukh's health and allowed to continue the "judicial" meeting. Earlier, during the court session "judge" Elena Tedeyeva rejected the motion of the defense of the activist that he needed to be examined in the Simferopol hospital, as in he could not be provided with a proper medical care in Razdolne. She argued this by the fact that Razdolnensky district hospital could provide with medical care. The "court" forbade Balukh to communicate with his wife, son and lawyers. 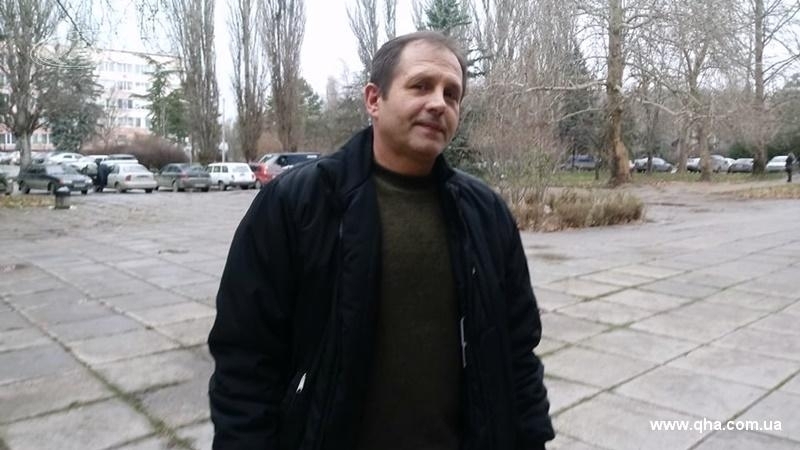 Earlier, QHA reported that in the occupied Simferopol, a preliminary investigation ended on the criminal case against Ukrainian activist Volodymyr Balukh. The case was initiated under part 1 of Art. 318 of the Russian Criminal Code (the use of violence against a representative of the authorities). Balukh is accused of allegedly hitting Valery Tkachenko, the Head of Razdolnensky detention center. According to the lawyer Dmitry Dinze, a protocol of familiarization with the case materials was signed on December 17. Previously, the Razdolnensky district court was to interrogate Viktor Palagin, the head of the Crimean Federal Security Service, as a witness in the case of Volodymyr Balukh, but he did not appear in court. Leonov and Zabar, other FSB agents summoned by the court as witnesses, also did not attend the court session. The defense of Volodymyr Balukh informed that they would challenge the decision of the court, which changed the preventive measure for the detainee for house arrest, but without the right to move around the house and communicate by phone with lawyers. On October 24, the Kremlin-controlled Razdolnensky district court left the Ukrainian activist Volodymir Balukh in custody until January 16, 2018. During the debate, the prosecutor stated that there were no grounds for changing the measure of detention, and that Balukh, while at large, could allegedly begin to engage in "illegal activities" again. December 8, 2016, FSB officers in the annexed Crimea arrived in the village of Serebryanka, where they conducted searches in the homes of Ukrainian activist Volodymyr Balukh and his mother. After the search, the activist was detained allegedly because of the evidence found in the attic of the house in the form of 90 rounds and TNT. August 4, Razdolnensky court of the Crimea sentenced Balukh to 3 years and 7 months of imprisonment in the colony of the general regime, as well as a fine of 10 thousand rubles. Reference: Volodymyr Balukh is a Crimean farmer who hung a Ukrainian flag on his house in 2014, which was repeatedly ripped off by the Crimean security forces. In November 2016 Volodymyr attached a sign to his house with the inscription "18, Heroes of Heavenly Hundred Street". According to him, after that he started receiving threats from local “administration” saying that if he did not remove it, then some drugs or weapons could be found in his house, which, in fact, happened.